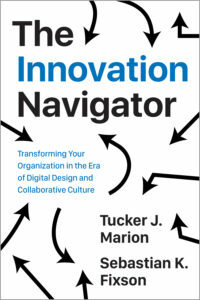 Due for release in October 2018, The Innovation Navigator explores four innovation archetypes–“specialist,” “venture,” “community,” and “network,” and guides the reader in exploiting these different modes of innovation. Marion and Fixon provide a framework for how firms can leverage dynamic mode shift and multimode strategies by profiling firms across the industrial spectrum: Formlabs, Forth, GE Appliances, and FirstBuild, to name a few. Over thirty years ago, in 1986, Takeuchi and Nonaka, two Japanese management scholars, recommended firms to replace their old, sequential process with a new approach – rugby-style, passing the ‘ball’ within the team down the field. They called it the “new new product development game.” It was a call to action for firms to reinvent their innovation process. Firms rightfully focused on cross-functional teams and Japanese-style management tools and techniques. A house of quality for everyone. This was followed by Six Sigma and Black Belts, disruptive innovation theories, and more recently Design Thinking. Despite all of these important initiatives, tools, techniques and consultants’ advice, many firms still struggle with their innovation efforts. In fact, the failure rate of new products and services remains essentially unchanged – since 1968!ii Depending on the study, the failure rate for newly launched products and services is around 40%.iii And even highly successful firms like Ford and Apple, go through periods and cycles of reinvigorating their innovation process, then falling back with a return to bad habits. As we prepare for the third decade of the 21st century and what will certainly be a dynamic and challenging time for companies, there is a clear need to look at the entirety of the innovation landscape, and strategically think about your approach to innovation and how it can be improved – i.e., better innovations commercialized more quickly. Firms must innovate to remain competitive and relevant in their respective industries, and this book analyzes those innovation tracks that are best suited to a specific company, culture, and vision.